The lineage of automotive history is replete with recognizable names from some of the most established and prestigious brands, many of them still flourishing in this modern age. Those that do endure tend to share a commonality in progress. Unsurprisingly, names like Daimler, Olds, and Maybach were all players in the invention of what would (hopefully) bring the entire automotive industry to a screeching halt: the brake. As early as the late 1800s, people were toying with brake designs. The drum brake came to be by Louis Renault’s hand in 1902, while the disc brake was a product of Frederick Lanchester in the same year (both are still used today). However, like most good things in the automotive industry, the brake was revolutionized by racing heritage. In 1953, brakes became an instrument of performance when, during that year’s 24 Hours of Le Mans race in France, brakes were a deciding factor. As the name of the race implies, drivers must find a balance between speed and managing the mechanical endurance of their cars. Jaguar, the only car fitted with disc brakes, took the victory that year over rivals like Ferrari. In such a demanding performance race, Jaguar credited the disc brakes with contributing to the win. Jaguar took its position atop the podium, and the disc brake took its position as a premier automotive component. Two years later, the first mass-produced automobiles sported disc brakes. 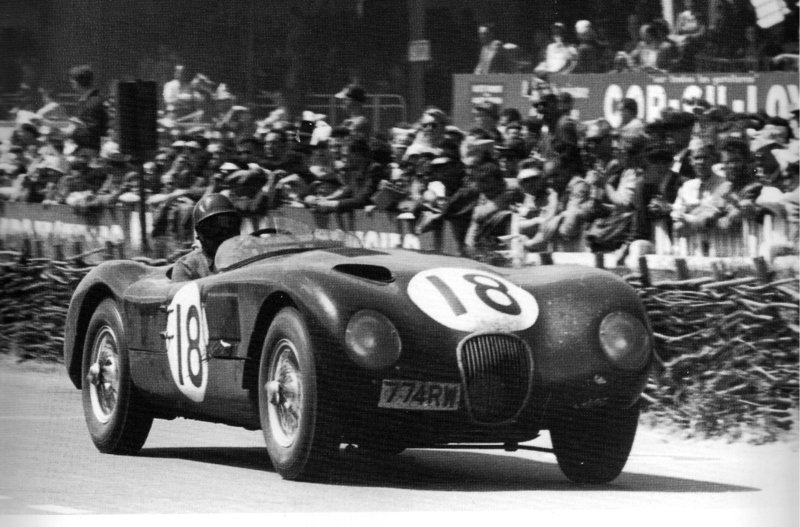 Photograph of the Jaguar C Type driven by Duncan Hamilton and Tony Rolt in the 1953 Le Mans race: https://stevemckelvie.files.wordpress.com/2013/06/scan0558.jpg. The U.S. has since played host to a shift from drum brakes to disc brakes, although both are typically part of a larger air brake system in semi trucks. Most automobiles are now fitted with disc brakes, which use brake pads to apply friction, as they are more efficient at stopping and cool at a faster rate than the drum brake. International tractor-trailer markets appear to have made what some say is the inevitable transition to disc brakes. For some reason, though, U.S. tractor-trailer owners tend to stick with improved designs of the drum brake, which use brake shoes to apply friction. The drums offer a familiarity and lower cost (when properly applied) that pushes domestic drivers to stick with them. No matter the type of brake, drivers want only one thing when that child runs out into the street without an instant's notice: stopping power. You see it every day in car commercials. Once you move past the slow-motion drift on the television screen, the most prevalent display is that of the car’s braking system, and the look of relief on the driver’s face when their brakes save lives. In that moment, they are the last line of defense; the brakes become the final hope in the fight against disaster. The same holds true for tractor-trailer drivers, but the potential for danger is much greater. With such a behemoth of a machine, capable of devastating force, it is no mystery why their brakes are so important. Brake failure is never a good thing, and one of the most notable ways it can happen is through the braking system becoming “over-cammed.” Without getting overly technical, this occurs when the rotational components that apply friction to the wheel fail to contact the wheel, thus failing to provide friction and failing to slow the vehicle. This can happen one of three ways: (1) the brake pads/shoes are too thin to reach the wheel, and cannot apply friction, (2) the slack adjuster is improperly calibrated, leading to airflow that doesn’t allow the brakes to properly function, or (3) a combination of both of those things. The result of any of these is tragedy. Ultimately, a good inspection and report system by the drivers can be a great instrument in the prevention of injuries and deaths due to tractor-trailer accidents. At Bailey & Oliver, it is a priority to eliminate accidents caused by tractor-trailers. We are dedicated to ensuring that the big trucks do their part in following the rules of the road, and we continue to work tirelessly to make our community a safe place.